Halloween is almost here, so we've put together a practice that's choc-full of holiday-themed poses you can use to infuse your yoga classes or home practice with some creepy creativity (we promise they're not too scary!). 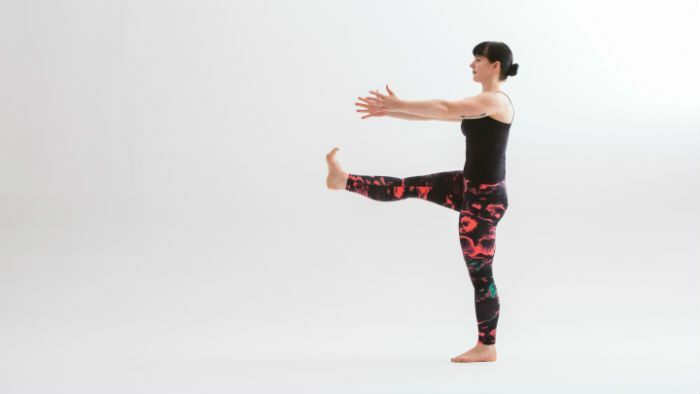 These sequence suggestions are fun for yogis of all ages. You can sprinkle in a few “treats” here and there or turn your entire class/practice into a spooky extravaganza! What better way to start a Halloween Yoga Practice than shavasana (corpse pose)? Its seasonally appropriate name aside, shavasana is a perfect pose for settling in, connecting with the breath, and preparing for a lighthearted yet challenging practice. For an additional warmup suggestion, try this creative take on some familiar core work. From downward facing dog (or “downward facing hellhound,” if you prefer), inhale your right leg up into a three-legged dog/hound. Exhale, draw your right knee in toward your chest, shifting forward as if you were coming into plank pose, but round your back. Stay here and breathe. Your right (bent knee) hip will tend to dip down here; if that's happening, lift it higher so that it's level with your left hip. Either stay here, or, if you feel stable, you can come onto your left fingertips, extending your left arm forward like a werewolf on the prowl! Gaze slightly forward toward your hand and try to keep your hips level. Enjoy the balance challenge, then return to downdog and change sides. Don't worry, #TeamEdward, there's something here for you too. From downdog, walk to the top of your mat and rise up to standing with your feet together or slightly apart. Slowly ascend up onto the balls of your feet and simultaneously raise your arms up until they form a “V,” flexing your wrists and connecting your thumbs and index fingers (as though you were holding up your fabulous vampire cape), as you lift your chest into a slight backbend. Return your arms to your sides as you slowly lower down. Repeat a few times. This is like the classic side stretch, but with an added balance challenge! From mountain pose, extend your left leg out to the side and rest your big toe lightly on the floor. Float your arms up and hold your right wrist with your left hand (palm can face up or down). Bend your elbows to start. Take an inhale to lengthen, and on an exhale, side-bend to your right. You can start to straighten your arms if it feels okay for your shoulders. Then see if you can float your big toe away from the floor, so you're just balancing on your right foot. Stay for a few breaths, then return to center on an inhale, stepping your left foot down beside your right and releasing your arms down to your sides. Repeat on the second side. Scary-up your wide-legged squats with a few lion's—ahem, we mean “monster”— roars. Start in a five-pointed-star pose (legs wide, feet turned out, arms extended out to a “V” with fingers spread wide). Inhale here, gazing up toward the sky. Then, as you exhale through your mouth, stick out your tongue and make as frightening a face as you can muster, while bending your knees into the squat and drawing your elbows in toward your sides. Inhale, return to five-pointed star, and repeat several times. This festive, flowing form of cobra is called nagani madasana in Sanskrit, which literally means “intoxicated snake.” Harry Potter fans may notice that “nagani” (snake) sounds awfully similar to the name of Voldemort's snake Nagini (which means “female snake”). To practice this variation, come onto your belly and set up like you would for traditional cobra pose. Then come onto your fingertips and walk your hands out so wide that they come off of your mat. Walk your hands back so they're in line with your heart (if this feels like too much for your shoulders, you can keep your hands further forward). Stay broad across your shoulders (watch that they don't dip below your elbows). On an inhale, lead with your chest and let your head follow as you rise up into a fingertip cobra. Enjoy a few breaths here, or explore undulating from side to side in your upper body (lower body stays stable) like a dancing (or slightly tipsy) serpent. Dress your dolphin up as a “sea monster” this Halloween. Start on forearms and knees with your shoulders stacked directly above your elbows. Keeping your elbows where they are, bring your hands together into prayer position so you can press down into the entire pinky side of your forearms, wrists, and hands. From here, tuck your toes under, and press up into “sea monster.” Keep your shoulders stacked over your elbows, and gaze back toward your legs. Resist your outer forearms in toward each other, and at the same time push the floor away from you, as though you were the Creature from the Black Lagoon emerging up out of the water. From sea monster pose, walk your feet forward toward your elbows. (If you find that you’re collapsing into your shoulders, walk your feet back again, and just stick with sea monster.) Lift one of your legs, bend your standing-leg knee, and kick up into a forearm balance. When you arrive in the pose, continue to hug your outer forearms in toward each other and push the floor away. Instead of gazing toward your hands, tuck your chin slightly so that the crown of your head hovers away from the floor. To exit the pose, return your feet to the floor one at a time, walk them back, and then lower your knees to the floor. From mountain pose, set up for parshvottanasana (pyramid pose) by stepping your left foot back about a leg's length, and spinning it flat to the floor so your left toes point to the upper left corner of your mat. Bend your left elbow, and bring the back of your left hand to rest on your sacrum; extend your right arm alongside your ear. Lengthen up through your spine as you inhale, and on an exhale, hinge at your hips and come forward only as far as you can maintain a long spine (no more than halfway down, and it's okay to bend your front knee!). On an inhale, rise back up, like a mummy rising up out of its tomb. Repeat four more times before releasing forward into parshvottanasana. Stay for a few breaths, and then rise all the way up to standing again (with a long spine), step forward to mountain pose, and repeat on the second side. Stand at the top of your mat in tadasana. Shift your weight into your left foot, and bend your right knee, drawing your thigh up toward your belly. Interlace your hands underneath your right thigh, bind your big toe, or catch hold of the pinky-toe side of your foot. Stand tall. 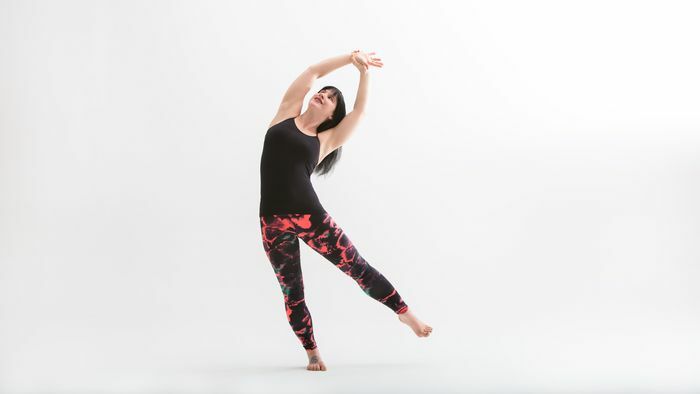 Press the top of your standing-leg thigh back, lift up through your low belly, and lengthen through your crown. Extend your right leg toward straight only if you can do so without collapsing (rounding your back and/or pushing your pelvis forward). Enjoy a few breaths here. Then, attempting to keep your lifted leg right where it is, extend both arms straight out in front of you (think “zombie seeking brains”) and stay for a few more breaths. Then release your right foot down to meet your left foot, lower your arms, and change sides. 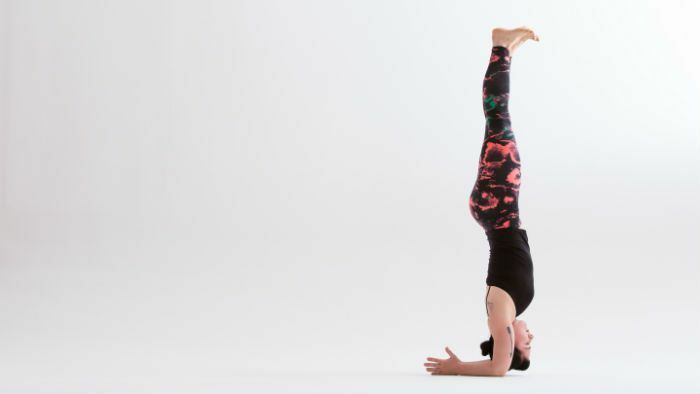 Kakasana (crow pose) can sometimes seem like a scary asana—largely due to the fact that one may risk falling on one's face. To lessen this risk (and your fear), try practicing with a bolster or stack of blankets in front of you at first. From mountain pose, plant your hands on the floor (or blocks) beside you and lift up onto the balls of your feet. Bend your elbows (back toward your body, not out), and bring your knees up high on the backs of your upper arms. Start to shift your weight forward. Lift one foot at a time, with toes spread. When the second foot lifts, press the inner edges of both feet together. Push the floor away; round your back, and move your chest forward. Why not let your eka hasta bhujasana (elephant trunk pose) masquerade as a witch (or wizard) on a broomstick this All Hallow's Eve? Before you take flight, it's a good idea to include a few preparatory “hip openers,” like agnistambhasana (fire log, or “double pigeon”) and leg cradle in your practice. Just for today, transform your shalabhasana (locust pose) into a “hovering ghost”! Lie on your belly with your arms alongside you with palms down and forehead on the floor. Bring your legs as close together as you can (all the way together, if possible). On an inhale, lift your chest, head, and hands up off the floor, turning your palms to face toward each other. If it feels okay for your lower back, you can lift your legs up off the floor as well. Stay broad through your chest. Keep the back of your neck long (gaze down or slightly forward). Hug your legs together. You're hovering all of your limbs up away from the floor, just like a ghost hovering around an eerie old haunted house! Release on an exhale. Rest your forehead on stacked hands, or turn your head to the side. Repeat two more times. 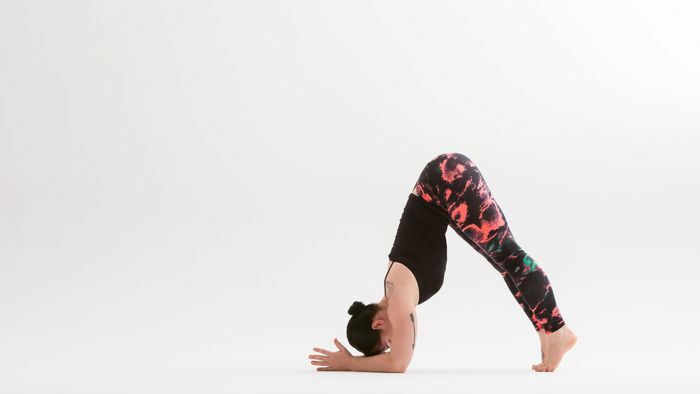 If you could use a little more backbending, feel free to include a “creeky old drawbridge” (i.e., bridge pose) or two in your practice, then enjoy a few breaths in constructive rest, or “half dead” pose (lying on your back, feet flat on the floor). Wind down this “twisted” practice with the supine twist of your choice. And (of course!) finish just as you started, in corpse pose. Sequence written by Kat Heagberg and Emily Smith. Wardrobe: The Vortex Capri and Airbrush Legging by alo.